Kerry Gross rode her bike over 5,000 miles across the United States. She was alone, and it was her first bike tour. However, Kerry intuitively understood that she’d need a really good reason to keep her pedaling through the difficult times. “I knew I needed something more than just biking to keep me going day in and day out,” she said in Part One of this interview. So Kerry decided to combine biking across the country with her resolution to share the stories of remarkable women. That’s right: she cycled from one town to another, interviewing badass ladies about their epic lives. And now, Kerry shares those stories as the host and producer of her podcast Women Who Dare. It’s true for every commitment we make in life: In order to follow through with anything challenging, we have to fall in love with our ‘Reasons Why.’ My own cross-country tour was born from the desire to face my fear of men. I wanted so badly to get over my phobia, and to feel secure and at peace in the world. On the worst days, when the wind was howling or the cold rain was pouring or I felt unsafe in a certain situation, I'd ask myself, “Why am I here? Why should I continue?" The reasons would flood my brain, loud and insistent: to develop more patience, to become my own best friend, to face my fears, to discover if the world was really as scary as I’d been lead to believe. To learn what I was made of. I wanted so badly to change. And, in the end, my bicycle tour did change me. For the better. When I asked Kerry Gross what advice she’d offer to a women who wants to try solo, long-distance bike travel, but who feels hesitant, she gave a great answer. I couldn’t agree with it more. So here’s an exercise, in Kerry’s own words, about how to discover what’s holding you back. And, from this exercise, your ‘Reasons Why’ are likely to surface. “Write down all the things that are causing you to hesitate. Rank them by the degree to which each hesitation is stopping you from actually leaving the house. Then, consider each hesitation that's actually stopping you from going on tour. - What is it about this hesitation that's stopping you? - What small step can you take today to make this hesitation seem less daunting? - And what small step can you take tomorrow? And the next day? And the next day? - How will you know when you've succeed with each of these small steps? - Now that you have a plan, do you see a path to a bike tour? If you're having trouble confronting a hesitation on your own, ask a friend to help you make a plan. Chances are, they'll help you see your hesitations in a new light. And then, they'll be there to help you as you take each step. Thank you, Kerry Gross. You’re an inspiration to us all! 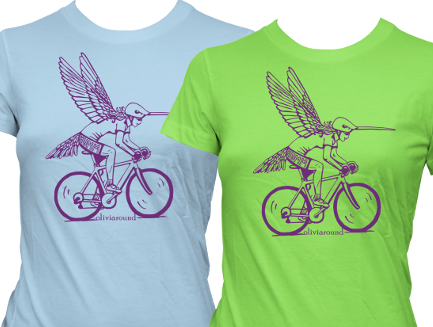 Check out my merch featuring awesome lady cyclists!